I have to admit when I was first asked to review The Snow Queen by Vertical Entertainment, a bunch of other movies popped into my head at first as I had never heard of it before now. However, I am glad I didn't let this one go by as the more I read about it, the more I wanted to see the movie myself! "Based on the beloved fairy tale by Hans Christian Anderson, The Snow Queen has grossed more than $14 million to date in worldwide box office and a sequel is already in the works, with plans for a winter 2014 release. 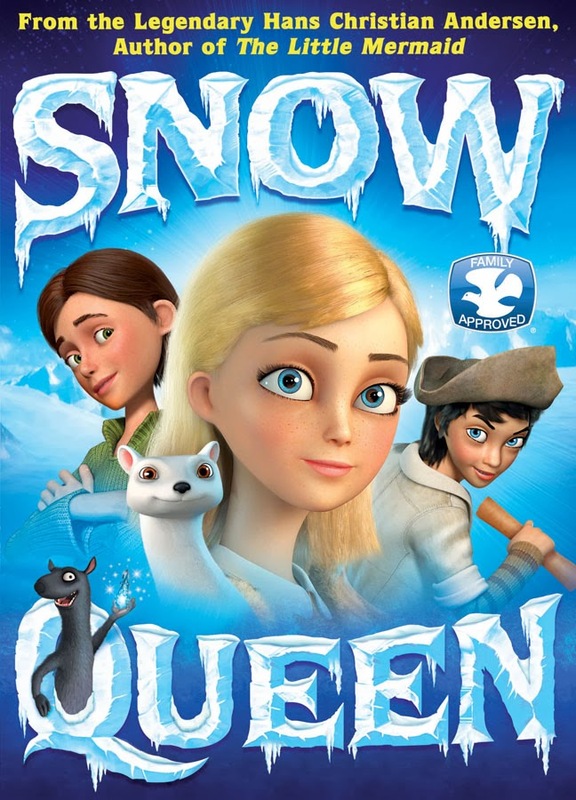 The Snow Queen was released on DVD and Video On Demand on November 26, 2013 from Vertical Entertainment. This movie features an original soundtrack from Emmy-nominated composer Mark Willott! Once I told the boys this one was heading our way they couldn't wait for it to arrive. The Synopsis says "In a land far, far away, the wicked Snow Queen has blanketed the kingdom in ice, plotting to turn it into a frozen landscape and imprison its people in a never-ending winter sleep, with no light, joy or happiness and no free will. The only remaining obstacle to her evil plan is Vegard, a master glassmaker whose mirrors reflect not only appearances but reveal a person’s soul … So one day, the Queen’s cruel polar wind comes and takes him and his wife away forever. But when the Snow Queen’s servant stumbles across an orphanage and a young boy named Kai – rumored to be the glassmaker’s son and to bear his father’s powers as a wizard – the boy is abducted and held captive in the palace. Now it is up to his sister, Gerda, to rescue him before it’s too late! The determined girl treks across the forbidding and frigid land, battling daunting obstacles and encountering new friends who help in her quest to set Kai free, defeat the Snow Queen and save the world from eternal frost." I've got to say I thought this was such a cute way to portray a good ole fairy tale old school style combined with the technology of today. The graphics were great and there were bright colors keeping the boys entertained. The story line wasn't as cheesy as most movies of today and both myself and Alana enjoyed watching this along with them. I thought this was adorable! Recommendation: Although this is expensive for a children's DVD in my eyes, I like that the graphics are bright and exciting as well as the boys seem to enjoy watching it without getting bored easily. Giveaway: Vertical Entertainment is going to give one of A Lucky Ladybug's lucky readers The Snow Queen DVD to have of their own! To my daughter, Jade. What a great winter giveaway! I would love to give to my daughters. If I were to win this I would keep it for my grand daughter. I will give this to my niece. I will give this to my neighbor's daughter. I will give this to my daughter if I win!